Like all metal casting processes, permanent mold casting has its own set of limitations, disadvantages and advantages. The required strength and soundness of the part. The smoothness of the surface and the wall thicknesses required. The design and shape of the part to be produced. Only materials with lower melting temperatures can be used in the process. While cast iron parts are manufactured using this process, the high melting point of cast iron does have a negative (or ‘wearing’) effect on the mold used. Part geometry is limited with this process as the mold needs to open and close. This particular casting process becomes a less viable option when compared to sand casting in cases where three or more sand cores are required. A high tooling cost and a long set-up time. The permanent mold casting process is, in general, limited to smaller castings. Because of the high tooling cost involved, a high production volume is needed in order to make this process and economically viable manufacturing option. The higher the pouring temperature of the molten metal, the shorter the life of the mold. The main advantage of permanent mold casting is the fact that mold used in the process, can be reused. The process is capable of producing more complex shapes and designs than sand casting. The part casted has a good surface finish (as casted). The surface finish delivered here is better than that of sand casted parts and components. 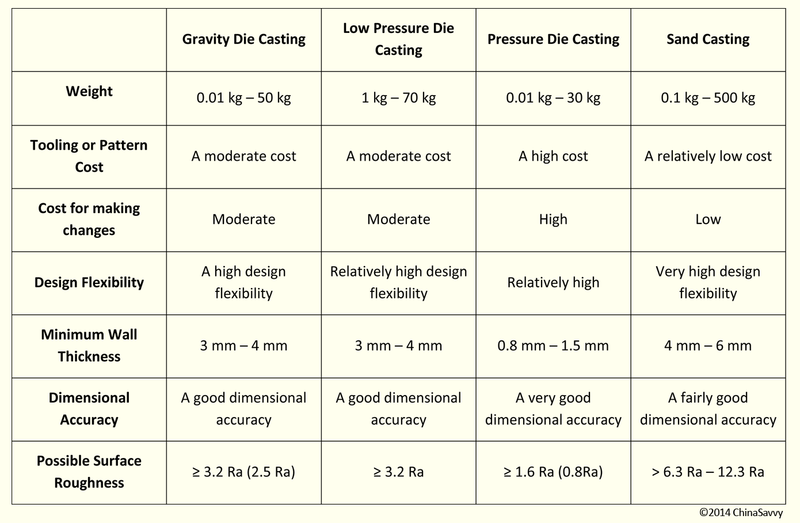 Gravity die casting allows for a more precise control over dimensional attributes than sand casting processes are able to. The casting process itself is highly repeatable and is well suited for high volume production runs. The process can also be a highly automated one. Permanent mold casted parts have good mechanical properties, low shrinkage and a low gas porosity. Parts have a homogeneous grain structure and the process itself produces little scrap. 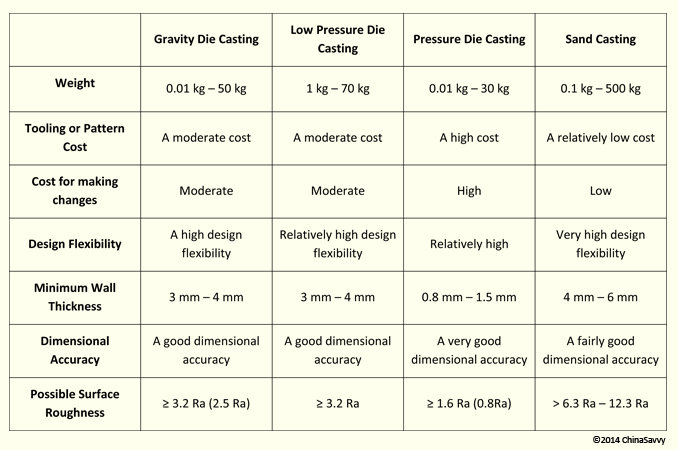 Compared to sand casted parts, permanent mold casted parts exhibit better mechanical properties. This is because the part solidifies quicker than the part produced using sand casting techniques. This is only one of the advantages of casting using permanent mold techniques over sand casting processes. Permanent mold casts also have a more laminar fill, also resulting in better mechanical properties than that of sand casted parts. Compared to sand casted parts, parts produced using this method also requires lesser finishing operations and produces more complex shapes. More sound parts are produced than that seen in sand castings as the mold itself also tends to cool the molten metal. An excellent casting technique for non-porous and pressure tight castings, permanent mold castings can also in some cases be stronger than sand and die castings, and less porous than parts produced with die casting methods. While permanent mold casting has a higher production rate and a lower cost per part than sand casting, the tooling cost is higher. Exhibits a finer surface finish. Ready for finishing operations such as powder coatings. One of the advantages of casting using permanent mold techniques over die casting techniques is that the cost of tooling is dramatically lower. Note however that, in some cases, the cost per part may be higher. While precision die cast parts have a good soundness and strength near the surface, the more central portions of the casting do in some cases contain voids (caused by entrapped gas or air during injection). This is not a problem for permanent mold castings, but note however that molds can generate gasses, which can be entrapped in the metal. The avoidance of distortion and blistering. In cases where quality is key, permanent mold aluminum casting stands out over aluminum die casting and aluminum sand casting. Fine grain structures are achievable in cases where castings are rapidly cooled to solidify molten metal – the iron of permanent molds aids in drawing away heat rapidly from the aluminum, resulting in the creation of a fine grain structure. Compared to aluminum casted using sand casting techniques, a longer cool time is required, resulting a grain structure that more coarse and not as strong. Unlike die casting, aluminum sand and permanent mold casting makes use of risers. These risers supply additional metal as cooling and contraction takes place. This enables castings to be manufactured without shrinkage voids – something often found in die castings. Compared to the iron castings, aluminum castings offer designers considerable weight savings. While aluminum permanent mold and sand castings cost more when compared to equivalent iron castings, machining costs for aluminum are substantially less than the cost of machining grey iron parts. Because aluminum has a better castability, a better surface finish and closer tolerances are achievable. This also results in a lesser need of machining stock. Aluminum has a good thermal conductivity. This makes aluminum casts suitable for use in various applications such as cooling system parts in truck engines as well as transmission cases. Because aluminum has such a good ductility, attractive appearance and good resistance to corrosion it is often use for hand tools, equipment covers and control levers.